It's always nice when something turns out better than you expect - especially when it's something you weren't looking forward to. B.A.T.s (Battle Android Troopers) are totally artificial robotic soldiers with extremely primitive logic circuits and very sophisticated targeting sensors. They can absorb enormous amounts of battle damage and still continue their missions as long as their trigger finger circuits and weapon systems are intact. B.A.T.s are usually deployed from low flying aircraft without use of parachutes. This delivery system is quite demoralizing to opposing troops who happen to witness it and then survive the impending onslaught. A consignment of B.A.T.s were taken to a secret factory in the United Kingdom by Hotwire. The Cobra mechanic infused all the units with Nanomite technology, which operates on a molecular scale to improve its host equipment while destroying or repurposing enemy materials. He believes that using the microscopic machines will provide instantaneous repair of battle damaged B.A.T.s during combat, while great adding to the troopers' destructive capabilities. These Nanomite-enhanced troopers emit an eerie green glow and have an adverse environmental impact on everything they touch. 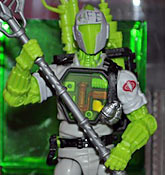 If all that talk about nanites destroying equipment and making better soldiers sounds like the Neo-Vipers from Rise of Cobra, there's a reason for that: the Nano-BAT is actually a cancelled movie figure. Remember the Walmart-exclusive two-packs with Gung-Ho, Shockblast, and Monkeywrench? Well, there were plans for a second series, this time featuring Budo vs. Dr. Mindbender and Zap vs. Nano-BAT. The figure in that set (if the stolen samples are to be believed) would have been neon green, but it would have been solid neon green - the final product is translucent green, and that's much cooler! Like the Hall of Heroes BAT, this figure includes both the standard and battle-damaged BAT heads. Funny that twice now Hasbro has planned to release this head, and both times the figure was cancelled, until a later exclusive release rescued it from the dustbin of history. 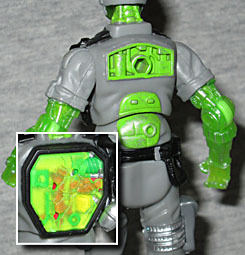 To go along with the ruined head, the Nano-BAT has the shattered chest plate. 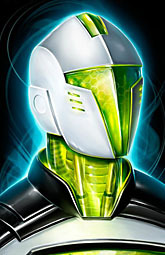 The bio suggests that the nanites can heal damage like a T-1000, and thanks to the accessories, you can play that over and over. There are no sculptural differences between this and the various other BAT models they've released, just paint - to go with his translucent green arms, he's got a gray uniform with black and silver accents. The arms are drybrushed with silver, to make the details stand out better than plain trans green would. Beyond the head and the chestplate, the Nano-BAT has the usual accessories. 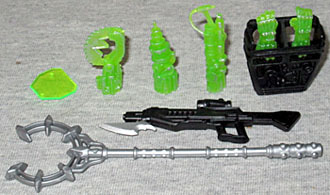 There are the removable arms, and the blaster, flamethrower and claw to replace them. The alternate arms all get the same silver drybrushing, by the way. There's the backpack to hold the weapons (though only two of them; we told you how to deal with that before). This release takes things a bit further, giving him one of the MARS Industries guns with a bayonet, and a staff that seems to be some sort of prisoner control device. It's a staff with a spiked hoop at the end, large enough to fit around any figure's neck and guide them to wherever you want them to go. The art on the Nano-BAT's card is simply a reworked version of the "Cobra Island" BAT painting, which is a little bit strange: since the figure was originally planned for the movie toys, packaging art was created by Mike Thompson - and we already know the Club has no problem reusing his art. The Nano-BAT isn't one of the FSS figures I was looking forward to, but it actually turned out pretty well. I probably wouldn't have bought him if he actually made it to stores, but it's an interesting new take on a standard old character. And even though it was intended for the movie continuity, it works well enough with the Real American Hero stuff as well.